The particular aim of the second module is to implement the carbon dioxide fiaxtion in E. coli. 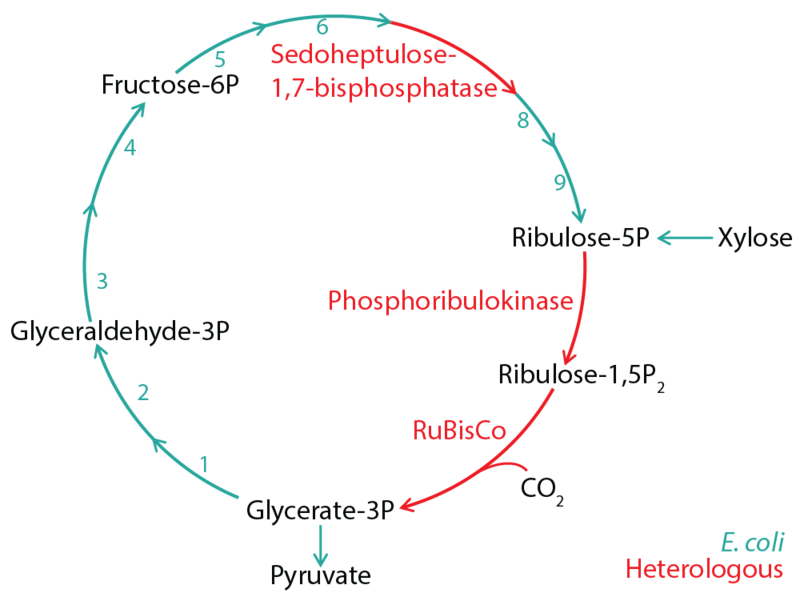 Therefore we selected the Calvin cycle (figure 1) and used a bottom up approach. All heterologous expressed components, like the sedoheptulose-1,7-bisphosphatase (glpX), the phosphoribulokinase (prkA) , the ribulose-1,5-bisphosphate carboxylase/oxygenase (RuBisCO) were tested separately in various experiments. The RubisCO is known to function best under high CO2 concentration. To accomplish optimal conditions for the RubisCO in a very local enviroment a microcompartiment from Halothiobacillus neapolitanus, which is called carboxysome, was constructed in E. coli. Figure 1: Schematic representation of the Calvin cylce. The reactions shown in green can be catalyzed by enzymes that naturally exist in E. coli, while the red ones need to be expressed heterologous to enable the whole Calvin cycle in E. coli.